This is a post for the Canadians out there, whether you read this blog occasionally, or if you found me through Google (probably most of you). Oman and Canada have good relations, but there are a few pieces of basic information worth sharing for any Canadians visiting (or thinking about living in) Oman. The reason why there is a Street address and a Postal address is that in Saudi (and Oman for that matter) there is no postal deliveries to addresses, they are delivered to PO boxes - there's no equivalent of Canada Post's house deliveries here. You can visit the embassy website by clicking here. Passport Application, Passport Renewal, Canadian Citizenship applications for newborns and Document attestation. If you are moving to Oman, your Canadian driving license will be accepted by the Royal Oman Police here, all you will need to do is show it when applying for an Omani license, and take an eye test, et voila: You'll get a 10 year Omani license (you don't need to surrender your Canadian license). 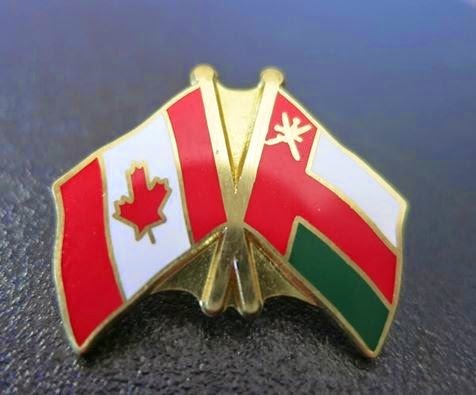 One important piece of information to note though; your Canadian license must be at least one year old - so if you just got married and you changed your name and got a new drivers licensed issued... you'll have to wait out 12 months before you can get your Omani drivers license. The fees at the time of writing were RO 20 for a 10 year car license, RO 15 for a 10 year motorbike license or RO 40 for a permanent driving license. There are no direct flights between Oman and Canada, you have to take a connecting flight, most people either fly direct to Doha, Abu Dhabi or Dubai on Qatar Airways, Etihad or Emirates and then connect here on a local flight. The alternative is flying into Europe and changing there for a flight to Muscat; British Airways, Lufthansa, KLM and Turkish Airways are the 4 most popular European stop-overs, although I understand flights through Cairo on Egpyt Air are quite cheap at the moment. Obviously everything changes all the time though. I am going back in a couple weeks, yay. Both the main gov. back in Canada, and the Embassy in Riyadh were TOTALLY unable to help me with what to do for a visa for my "Omani" not "Canadian" children however. So embassy in Riyadh, not super useful. OPNO - There is nothing stopping you for applying for citizenship for your kids. If you need the forms I can email those to you. You have to apply via Riyadh, but assuming you are a Canadian citizen, your kids can claim citizenship through you. If they couldn't help you, perhaps you were asking the wrong questions? There are a number of forms (instead of one, there's like 5 or something stupid) that you fill in. Your kids claim to Canadian citizenship is through you, and it is a legitimate claim. Fill the forms, submit them, and then you'll get Citizenship for your kids. It's not the easiest system, and Immigration Canada are, at times, not the most helpful, but you can do it. The Consulate here in Muscat has a girl working there and she's very helpful and can give you all the forms to fill in. That was, apparently, a question no one could answer. And when I applied for them as Omanis, because they are minors, but I am a Canadian, it wasn't the "right way" apparently... so I gave up at the moment. I think I will get their Omani father to take them when I want to go next time, or will think about a citizenship application. But thanks;). Maybe at least, for my daughter? : I had a super bad experience with Omani women trying to claim their legal rights to free movement, and to work and own a business, and while the laws exist, no supporting system to have those rights protected seems to exist so... I prefer maybe she be Canadian at least. But it technically means losing her Omani citizenship;), which means she couldn't marry from the GCC easily when older...so it is a lot to consider, thus I wanted her to be just a tourist for now... see her grandfather, experience the land-far-and-away... I'll let her choose, when she's older, what she wants. You have got to run a story on this…. What Oman doesn't know won't hurt it. I know of a few people who "renounced" their citizenship to take Omani citizenship, but they still actually are British, or French, etc. Same logic applies. A Canadian passport in this day and age is a lot more useful on the world stage than an Omani passport is right now. Oman will not know who are Canadian Citizens if it's never reported to them, just saying. Hey there! 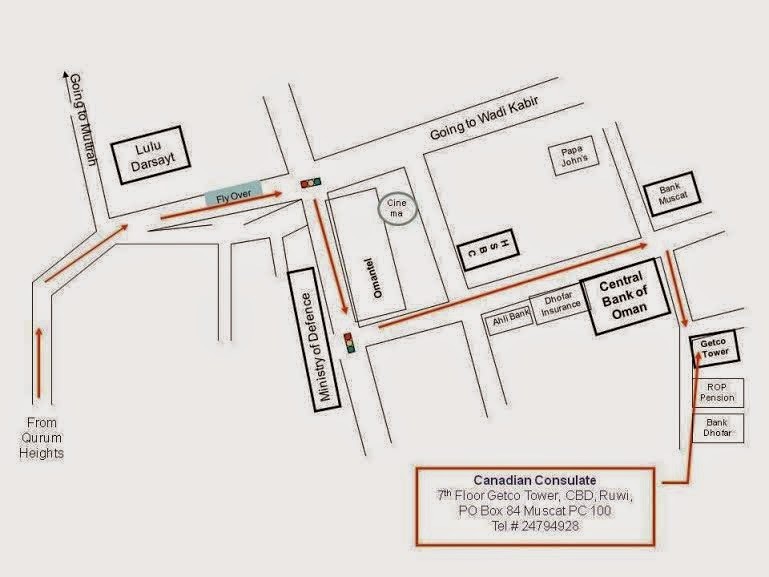 Thank you for this wonderful piece of information for us Canadians in Oman. I had one query, so, I possess an Ontario G2 license for say about 2 months.However, I have my G1 license for more than 12 months, so can I get an Omani driving license by showing my G1 which is well over 12 months? Or do I have to wait until I get my G and then wait for another year before applying? Thank You! ANON DEC 23 - Nice try bud, no, you need a full driving license (eg a G) for at least 12 months in order to get the ROP to issue you with an Omani driving license.